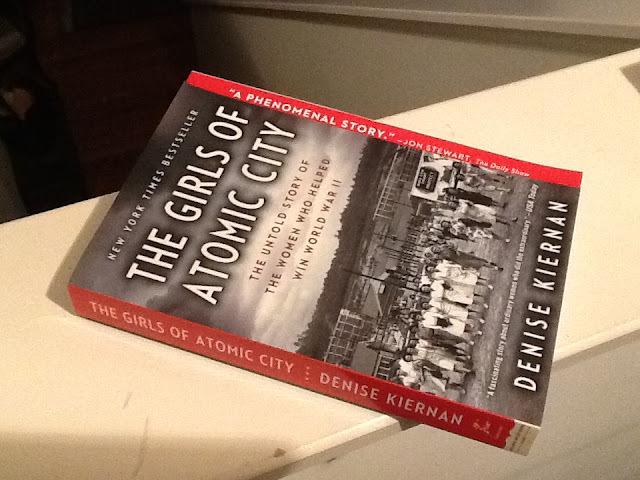 About a year ago, I borrowed from my local library Denise Kiernan's book The Girls of Atomic City: The Untold Story of the Women Who Helped Win World War II. Unfortunately, I hadn't yet finished it by the due date, so I had to take it back to the library. Obviously Fate intended me to be united with this book. I'd already read enough of it to know that it was well worth owning. I paid a dollar and went home with my very own copy. In the course of time, the Ela Area Public Library District chose The Girls of Atomic City as this year's tome in their One Book, One Reading Community program. They've lined up a variety of speakers over the summer weeks. I've agreed to give a talk on Wednesday, 8 July. Physicists discovered that uranium fission could be applied to make a devastating weapon--but it would take the help of hundreds of thousands of citizens working under the cloak of secrecy to make nuclear bombs a reality. Join Fermilab physicist William Higgins as he shares insights into this urgent effort...one of many memorable WWII dramas. Kiernan's book concentrates on the women who worked at Oak Ridge. I'll be giving an overview of the Manhattan Project. Hanford and Los Alamos were two other sites where secret towns employing thousands of workers sprang up to meet the needs of the massive project. I hope to say a few words about why Kiernan's book is both interesting to the average reader and also to the reader already steeped in Manhattan Project lore. I'm pleased that the Library District has invited me, and I'm looking forward to my visit.